This lesson is about the attached subject pronouns with the regular imperfective verbs. The attached subject pronoun ضَمِيْر فَاعِل مُتَّصِل, as its name suggests, functions as the verb subject. 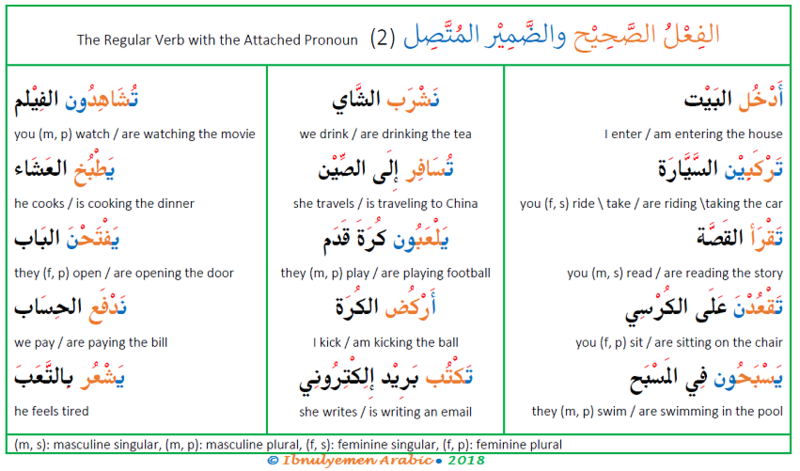 In the previous lesson, you learned about the attached subject pronouns that we add to the perfective verb الفِعْل المَاضِي. In this lesson, we focus on those that we attach to the regular imperfective verb الفَعْل المُضَارِع. At the start of the imperfective verb الفِعْل المُضارِع, there are four single-letter prefixes: أَ ، نَـ ، يـَ ، تَـ. For now, let’s say that they indicate that the verb (i.e. the action) is / takes place in the present. Unlike the perfective form, not every personal pronoun shows as an attached pronoun at the end of the imperfective verb. That is, half of the them are covert مُسْتَتِر. Since repetition speeds up learning and helps with vocabulary retention, let’s change verbs in last lessons into the imperfective form. أَ indicates the 1st person singular, نـ indicates the 1st person plural. The subject of both verbs is covert مُسْتَتِر that can be deduced from أ and نـ as أَنَا and نَحْنُ, respectively. تـ at start of the verbs indicates the 2nd person, so it occurs with all verb forms. The verb form with أَنْتَ is the default form (i.e. the form from which all others are derived), so its subject is covert understood from يـ as أَنْتَ. The ـين is the attached subject pronoun for أَنْتِ. The ـون is the attached subject pronoun for أَنْتُم. And the ـن is the attached subject pronoun for أَنْتُنَّ. يـ at the beginning of the verbs signifies the 3rd person, so it occurs with all verb forms. With هِيَ, the feminine marker تـ replaces the يـ. With both هُوَ and هِيَ, the subject is covert implied by the يـ and تـ as هُوَ and هِيَ, respectively. The ـون is the attached subject pronoun for هُم. And the ـنَ is the attached subject pronoun for هُنَّ. Note: Besides signifying the present tense, أ, نـ, تـ, and يـ stand for persons. That is, أ is for the 1st person singular; نـ is for the 1st person plural; تـ is for the 2nd person (all forms); and يـ is for the 3rd person (again, all forms). The تـ with هِي replaces the يـ to distinguish between the 3rd person masculine singular and the 3rd person feminine singular.